"How can I remember that Scott is the name of the van driver?" I don't have a good answer for Dad's question. He likes the man who drives him to his doctor appointments. Remembering is tricky business for Dad, and he creates a circus of flaming mental hoops to jump through for retrieving the names of people around him. "How can I remember that I need to go to Ace Hardware to buy brown leaf bags next Thanksgiving break?" Thank heaven my son helped me cut through my mental clutter to find the necessary bags at Ace. I'd wasted time looking for bags at the grocery store and Shopko each time the Big Rake Event rolled around. Raking Dad's yard requires a whole lotta leaf bags. Way down inside, mama, you gotta remember where to buy those bags. Bring on the mnemonic air guitar device! 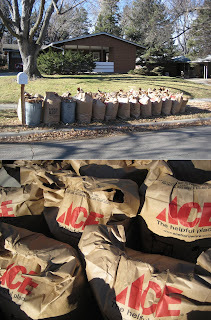 Ace is the place with the helpful leaf bag man, but the man is not all that memorable. He said if the big stack on the shelf in Aisle 6 was not enough, he could bring up another whole pallet of leaf bags for me. Need a pallet of bags. Need a pallet of bags. Maybe even Robert Plant and Jimmy Page rake their backyards in the fall. It shouldn't be that difficult to get their okay for Ace Hardware to use the music of "Whole Lotta Love" to make a leaf bag tv commercial. They already let Cadillac make the "Breakthrough" ad. Ace is the place with the whole lotta leaf bags. Can't you see the helpful hardward man playing air guitar on a rake? Great Scott! I'll have to tell Dad that expression is a minced oath that might help him remember about his van driver. I'll send him the illustrations of Superman saying, "Great Scott!"